Suction cup with studs. 40mm diameter. Suction cups are needed by almost all people nowadays. This is because it is easy to handle. People use these suction cups for many purposes in their day to day life. These suction cups will assist users to easily handle any stuff to hang. 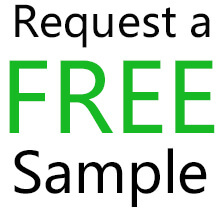 Anyone can easily purchase suction cups from Kingfar easily. Users can also get suction cups hooks easily. The suction cups that come with hooks are easy to fit anywhere, whether it is inside a home or office. Users can simply place the suction cup at the place they want with the help of this hook. People can use these suction cups for their needs without any strain. It is a more convenient way to hold things. 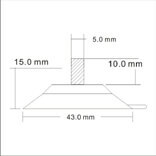 This product has a diameter of 40mm. 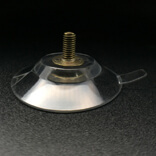 This Suction cups- Screw and Nut 40M5-10 is made with clear PVC. 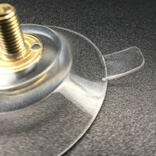 This will make the suction cup to last longer without being yellowish or fragile. 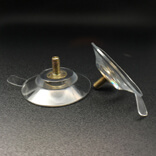 This product is supplied with separate tack to push into the back of the Suction cup. Users those who brought these hook with suction cup can use this for sucker needs. The total weight of this suction cup is 41 grams. 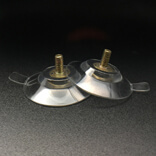 These suction cups with screws and nuts will replace the old poor suckers of the users. It also satisfies the sucker needs of the user. This product has a good sticky substance which lasts for a long time.